Here are the previous nativity patterns: Mary and baby Jesus, Joseph. Most of this pattern is continuous crochet and there are a few color changes. 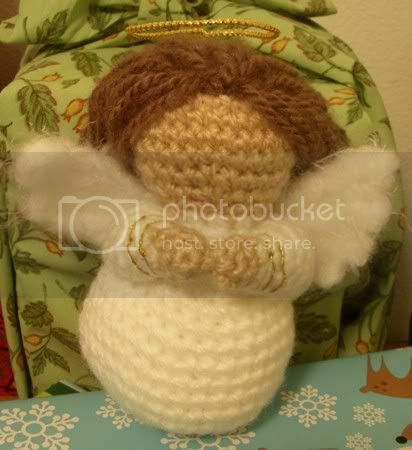 The wings are crocheted flat. I like to make all the accessories first so they are ready to be sewed on when I make the body. That's why they're listed first in the pattern. The finished size of the figure is 5 inches. Bulky weight yarn in a flesh color, white (for body and wings) and brown (for hair). I used Lion Brand Jiffy. Optional: you can also a fluffy or feathery white yarn for the wings. Optional: Bean bag plastic pellets. Putting some of these in the bottom of the Joseph figure can help it balance better. Make sure the pellets are large enough that they won't work their way through the crochet stitches. Pellets are not recommended if small children may have access to the figure. sc2tog = single crochet two stitches together, aka a decrease. (I recommend using falwyn's invisible decrease.) sc3tog = single crochet three stitches together. Go to my amigurumi wig instruction page and follow Steps 2-5 to add hair to the wig cap. Make two. Crocheted flat using white yarn (the same yarn as the body or the optional fluffy/feathery yarn). Leave a long tail at the start to use to sew the wing to the body. Row 1: ch 9. sc in second chain from hook. sc in each chain 7 more times (for a total of 8 sts). Row 2: ch 2. sc in second chain from hook. sc 7 (for a total of 8 sts). ch 1 and turn. Row 3: sc 5. slp st 1 and turn. Row 4: *sc 4. ch 1 and turn. Row 5: sc 4. slp st 1 in earlier row and turn. Row 6: *sc 3. ch 1 and turn. Row 7: sc 3. slp st 1 in earlier row. Bind off, leaving long tail to sew to body. * When doing a single crochet after a slip stitch, do not do the single crochet in the slip stitch. Instead, skip over the slip stitch and do it in the next single crochet (see video). Bind off, leaving tail to use to sew arm to body. If desired, used gold embroidery floss to decorate the sleeves. Stuff arm. Stuff the head. Sew the wig to the head (see Step 6 here). Sew arms to body underneath head. Sew wings behind arms. Stuff the upper part of body (stuffing it partially now is easier than trying to stuff the whole thing as you are closing it up). Step 1 if you do not have wired gold cord: cut a 9 inch length of regular gold cord and a 11 inch length of floral wire. Run the floral wire through the middle of the gold cord until one inch of the wire is exposed on either end of the cord. Go to Step 2. Step 1 if you do have wired gold cord: Cut an 11 inch length. Remove an inch of the cord from each end, leaving the wire exposed. Step 2: If needed, use glue or Fray Check to keep the raw ends of the cord from unraveling. Step 3: Holding the ends together, twist about two inches away from the ends to create a circle. Twist all the way down to the wire ends. Trim and style hair. Place halo on head by sticking the bare ends of the wire into the head. If desired, sew the angel's hands together in prayer. Pair with Joseph, Mary and baby Jesus and enjoy your nativity! These are amazing. Thanks so much for sharing them! What are you planning on doing for this year? Glad you like them! I will be busier than usual the next few months so I am planning on doing something small this year like a sheep. Hello again! after making many many many of the mary and jesus dolls, and several josephs and angels, I cannot wait to see what you come up with this year. I am in france visiting my aunt and uncle this christmas and have started a set of nativity dolls for them, promising to add more as you make them!!! thank you so much, once again! have a happy xmas and a brilliant new year! regards, Muna (from pakistan) the bad penny who always turns up! This year I am making a sheep. I have done three out of the seven I need to make before Christmas so I am in a rush to get the last few done! The pattern is going to take a little work before I can put it here because to make the sheep's body extra fluffy and wooly, I used a super bulky yarn. I doubt most people are going to be able to find that yarn so I am going to write an alternate pattern using the less bulky yarn I used to make the other figures. Thank you for the easy to follow angel wing video! It was the perfect way to complete my flying pig (pigasus). How tall are these? SO CUTE! Thanks. The finished size is about 5 inches. You should Pin your crochet items on Pintrest. I believe they are that great to do so. Hope you do!